Rocambole garlic is a popular heirloom cultivar. The cloves have a deeper, more full-bodied flavor than the usual variety and produce large cloves that are easily peeled. Their loose skins are also their biggest disadvantage because the loose skins contribute to a shorter storage life. Rocamboles harvested in summer or autumn do not usually last past January. One pound of seed garlic will yield approximately 60 plants. Here, broccoli rabe is briefly sautéed in cold-pressed olive oil, with thinly sliced rocambole garlic, then combined with steamed heirloom potatoes and a squeeze of lemon. This makes a lovely side dish; alternately, serve with poached farm eggs for a light supper. Cook potatoes and greens separately in salted boiling water until tender. When done, drain and coarsely chop. In the case of the greens, be sure to squeeze out as much water as possible. Set aside. Heat some olive oil in a large skillet. Add chopped garlic and a pinch of red pepper flakes. Alternately, add a pinch of ancho chile powder. Stir. 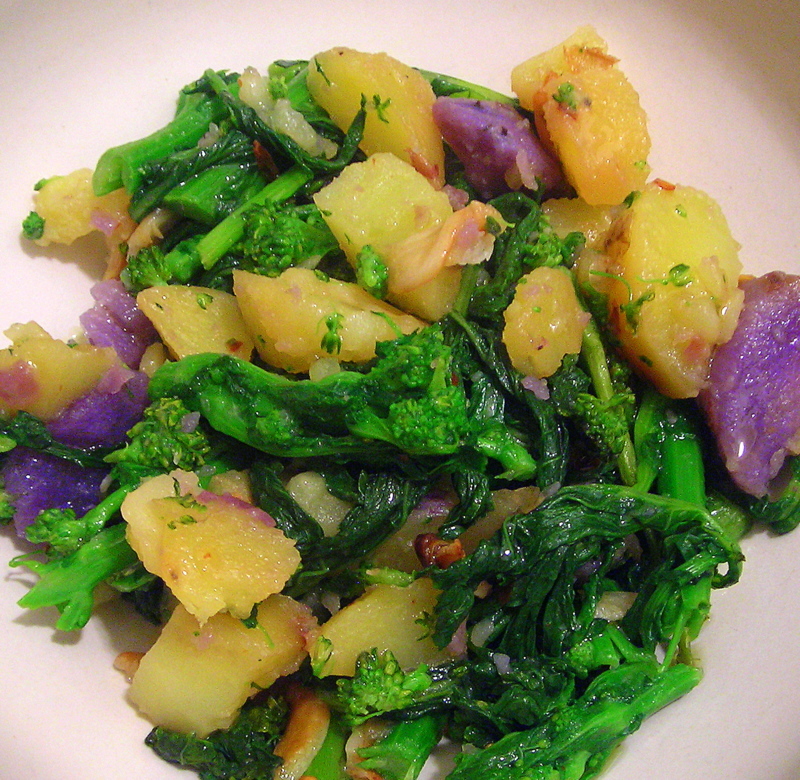 Once the garlic takes on a little color, add the potatoes and greens. Mash the potatoes with the back of a wooden spoon. Cook for about three to four minutes. Check for salt, although you shouldn’t really need too much. Remove from heat and serve immediately. Drizzle some extra-virgin olive oil and lemon juice atop each serving. 12 Jan	This entry was published on January 12, 2010 at 12:55 am. It’s filed under food, general, vegetarian, winter and tagged broccoli rabe, dinner, heirloom vegetables, potatoes, rocambole garlic, side dish, vegetarian. Bookmark the permalink. Follow any comments here with the RSS feed for this post. I actually made this last night. I added a little crushed green peppercorn to it. It was amazing, much like the author of this blog! that sounds simple and good.